This is a rectangular Postal Money Orders porcelain sign. This particular Postal Money Orders sign is white with red and blue text. 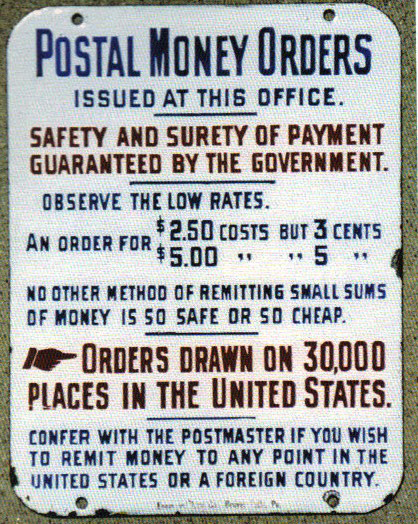 It reads, “Postal Money Orders Issued At This Post Office, Safety and Surety of Payment Guaranteed By the Government., Observe The Low Rates, An Order for $2.50 costs but 3 Cents, $5.00 costs but 5 Cents, No Other Method Of Remitting Small Sums of Money Is So Safe Or So Cheap, Orders Drawn on 30,000 Places In The United States, Confer With The Postmaster If You Wish To Remit Money To Any Point In The United States Or A Foreign Country” and features a red hand pointing to the right.